Juggling cat girls are a fav! 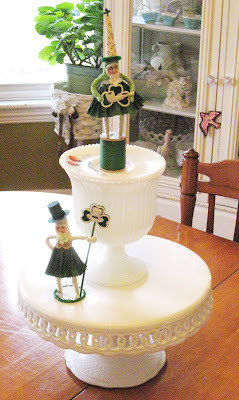 I'm digging the vintage Easter grass on the base. And someone really has her arms full! 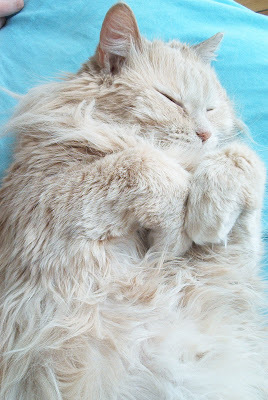 I'm loving the fluffy sheep! Germans loves their sheep...and they loved their fairy tales too! Goldie Locks and the Three Bears come face to face! I can never resist bunnies! Love the sherberty colors...it's probably my favorite part of Spring...along with the onset of warm weather! Back from New York City!! I had a great time in New York but am happy to be back in Boston in my cozy apartment! The show went great and I'm still just so thrilled that we were able to make it happen! 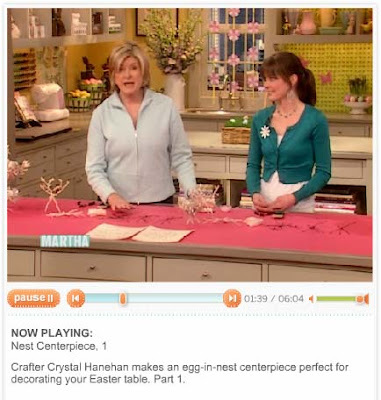 You can watch the segment on Martha's website here. The producers of the show and Martha's whole staff were so unbelievably nice and wonderful. They did a great job helping me outline the steps of the project and giving me tips when I was on air. The show aired live, but I tried not to think about that too much!! 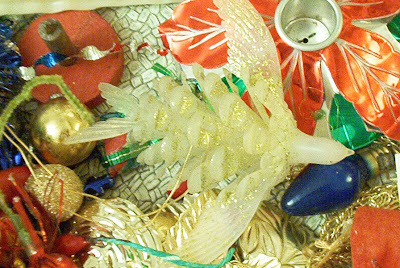 Martha gave me a bit of a hard time about the tinsel and the dollar store...but it was all in good fun! I stayed in Greenwich Village with my friend Dan (on the left) who was also in the audience and got to hold a bunny! He's a real character and it was great to have him along for the ride! 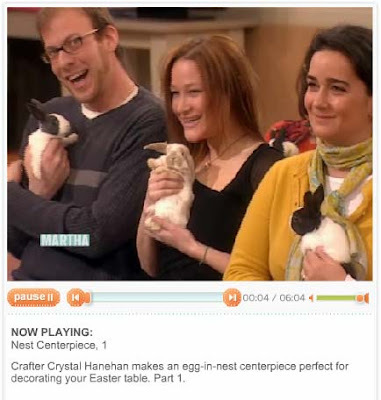 One of the best parts was seeing the craft studio and the set of the Martha Stewart show in person. They were amazing!!! The craft studio was stocked with every craft material imaginable all neatly organized and finished projects from the show and magazines were scattered about for inspiration. Loved it! And the set was so bright and warm. So cheery and inspiring! 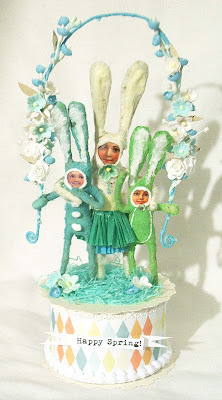 And they decorated it with a whole bunch of my little Easter characters! 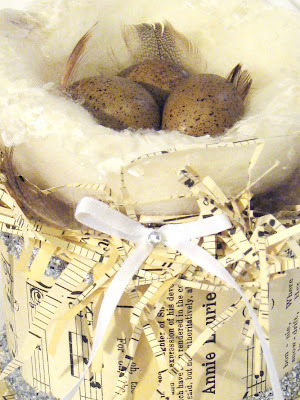 And of course I must mention the reason for being there at all...the nest project! 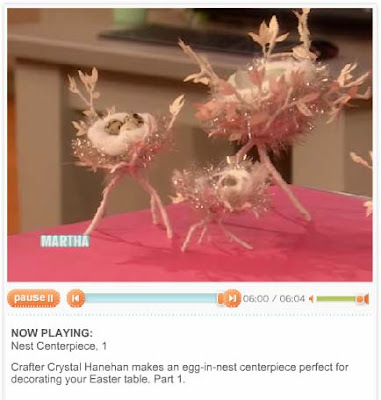 The directions and template for the armature are on Martha's website. It's a little bit of a challenging project, but it's so much fun once you get the hang of it!! 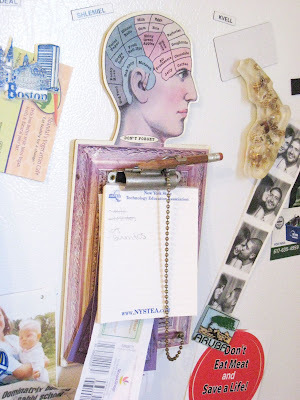 I was so flattered that Martha wanted to share it on her show and she even is taking one to keep in her house! 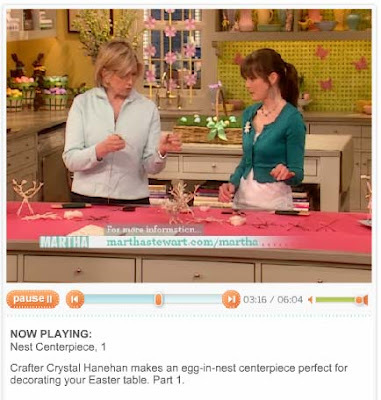 Watch me on the Martha Stewart Show this Wednesday! Yes it's true! 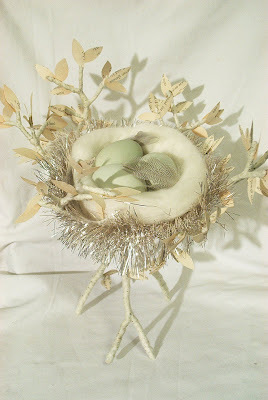 I will be teaching Martha how to make my pretty needle felted nest! I'm leaving for New York tonight and the show will be airing live on Wednesday. The best part? 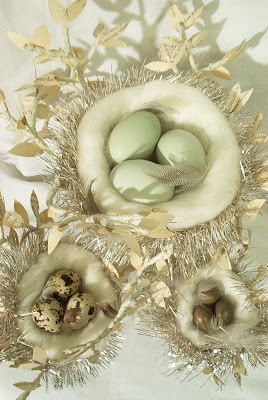 You can learn how to make a nest of your own! 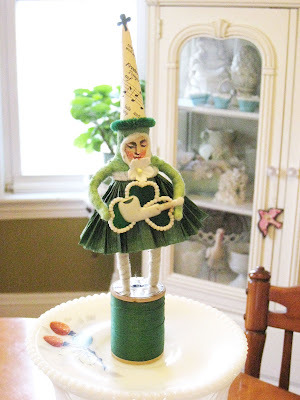 I'll be demonstrating on the show and there will also be instructions on Martha's website. Marc Morrone (the animal guy) will also be there on Wednesday and I'm really hoping to be able to hold one of the adorable bunnies he'll be showing off! Oh my gosh...I have goodies! 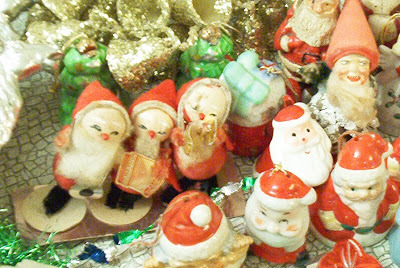 I had to let my heart palpitations settle down before I posted these photos...but two weekends ago I found the motherload of vintage and antique Christmas goodies!! 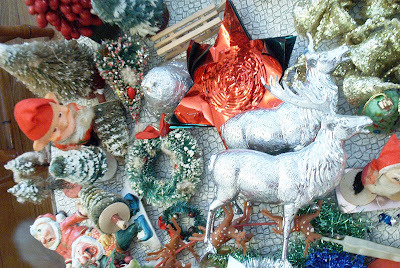 My favorite vendor at the local "ghetto" flea market knows I like old Christmas things and when she saw me she pulled out a full sized laundry basket FULL of old Christmas things! I almost died when I saw it! It took everything I had not to squeal in delight! I sorted through the basket and put almost everything in my bag. Many of the items were damaged due to the carelessness of the vendor (she literally piles everything into her booth...it looks like a true hoarders closet...junk hovering over your head!). It actually was good that some of the goodies were broken...that way I don't have to feel bad about taking them apart to use in my creations! 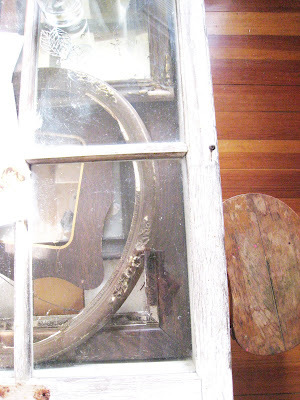 I just hate taking apart something that has been preserved so perfectly for so many years only to be destroyed by me. 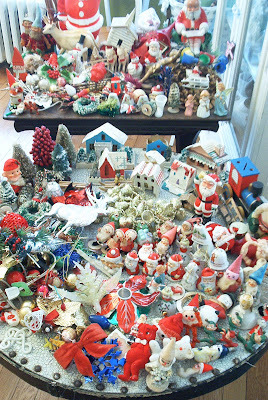 This is a shot of everything...I literally piled everything high...they wouldn't fit on the two tables! I'm in love!!! 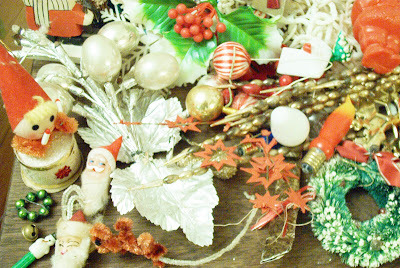 I can't wait to use these pieces to decorate with, use in my creations and offer for sale in my Vintage from Crystal Etsy shop! 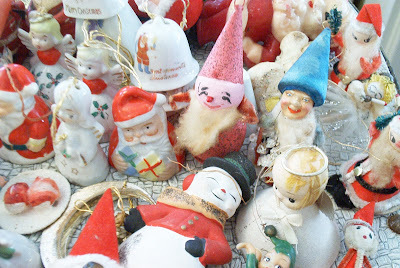 Those Christmas goodies weren't the only treasures I found at the flea market. 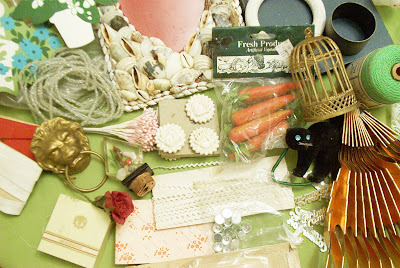 I found a few vintage crafts supplies, including old ribbon and ric rac, flowers stames, carrots, rosette curtain tacks, beads, rhinestones and more! 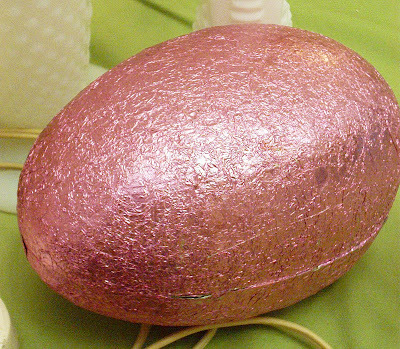 I nabbed this vintage German foil egg box as soon as I saw it! It's HUGE! 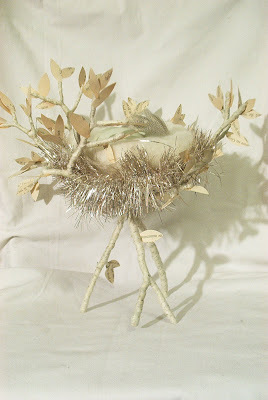 It's now the highlight of my table Easter centerpiece...I'll post photos of that later. 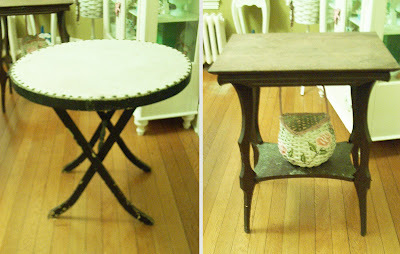 Lastly...I bought these two tables. They'll be great for the porches I'll have in my future home! ;) The old folding table was $3 and the end table was $5. They're both a little wobbly, but a little wood glue and some clamps and they'll be ready for an impromptu game of scrabble or a pretty lamp and some books! Welcome to my home! 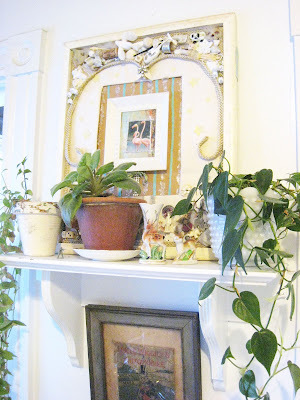 I'll be giving you a little mini tour of pieces and rooms and vignettes I have throughout my thrifty pad. I've been meaning to do this for a while now but have struggled with photography. I'm terrible with lighting and quality. The only way I can get photos to look decent is to fix them up majorly in photoshop...which is what I've done here! You wouldn't have believed how dark these photos started out. 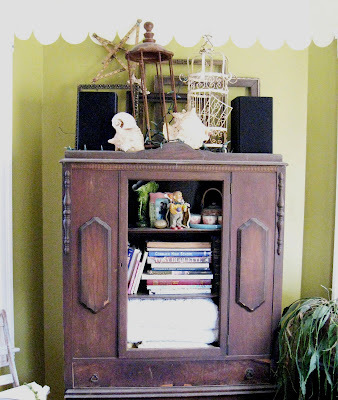 The photo above is of my Grandmother's old china cabinet that lives in the living room and is filled with books, Crystal and Ben memorabilia, and extra chenille blankets for those extra cold nights. There actually isn't any glass in the door thanks to Ben's dad who "helped" us move. He's so funny. He started moving the cabinet and I told him I wanted to tie it first...he said "no no no, I've got it, it will be fine". Two minutes later he flipped the cabinet around so the door flung open and hit the ground with all of the little broken glass pieces following. Well...thank goodness I'm a calm person, and now Magic is glad because she can easily jump from the back of the couch into the cabinet to cuddle on the cushy blankets! 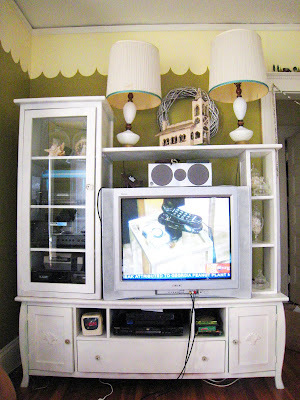 This isn't a magazine quality shot (what with Ben's wires spilling out from every crevice), but I had to show you our entertainment center. When first moved here Ben brought this ugly boxy brown thing and for the longest time it bugged the heck out of me. Finally we found this one on Craigslist for 100 bucks (not the best bargain...but not too bad either). 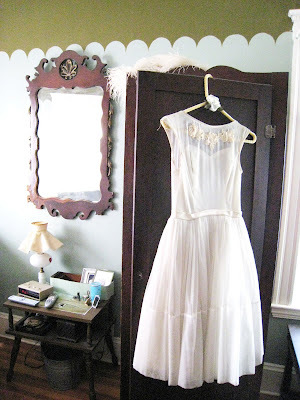 I wish I had a before shot but it went from retro modern to shabby country with a couple coats of white paint, some shabby wooden appliques and mix and match antique glass knobs. The space for the TV was so huge...but this presented a happy challenge for Ben who found that 32" flatscreen TV on Craigslist for $40! Some rich college kids were upgrading and wanted to get rid of it. Yay! 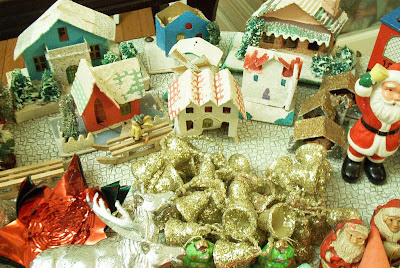 This is a sunny photo of the corner of our coffee table. I made the coffe and end tables out of old windows I found on the side of the road...one from a house and one from a horse barn...and concrete molds. They're shadow box style so I can store/display things in them. 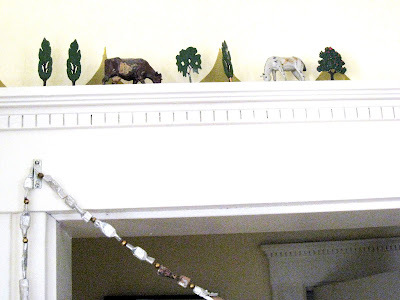 I love old mini animals and I have a horse/cow duo grazing among some trees I found in Germany on the molding over our archway. 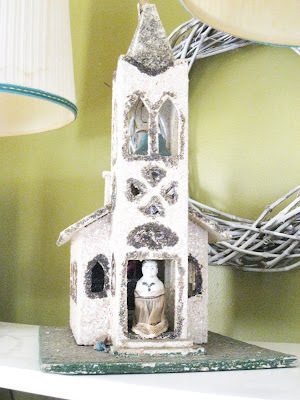 I couldn't resist leaving a few remnents from Christmas around the house as winter decor. 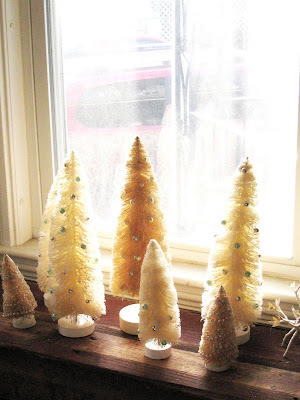 These large bottle brush trees fit the bill. Our bathroom is bright blue, brown and white. 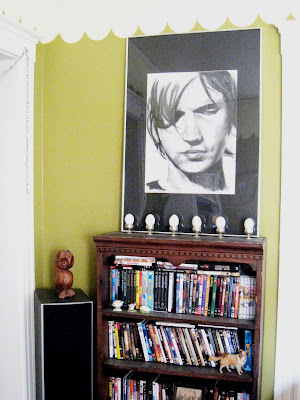 It's a small space so it can handle the color. This is a little shelf Ben's mom gave us. 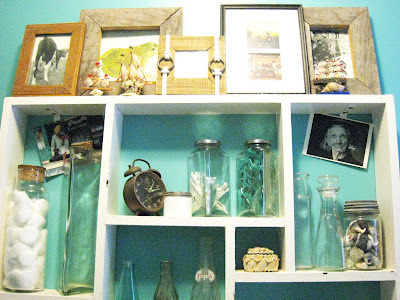 Glass jars and seashells is the theme here. 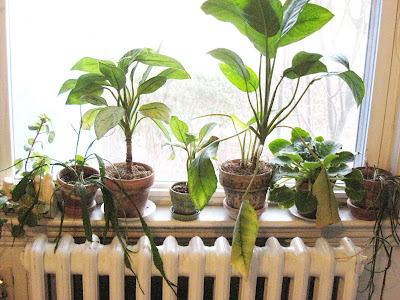 This is a pleasant little vignette in our kitchen. 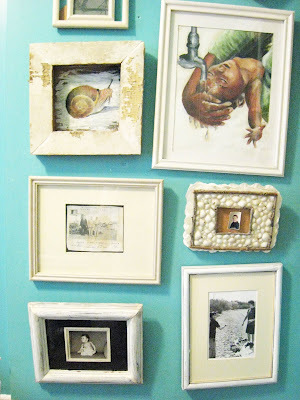 The collage I made a few years back and includes some memory invoking keepsakes. I have posted many photos of my dining room. 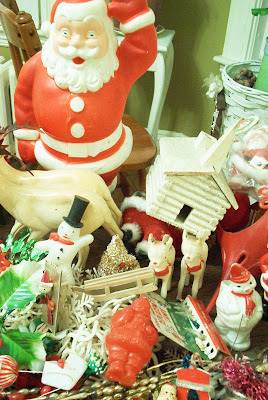 This is where I seasonally decorate the most and it has the best lighting for photos (sometimes). 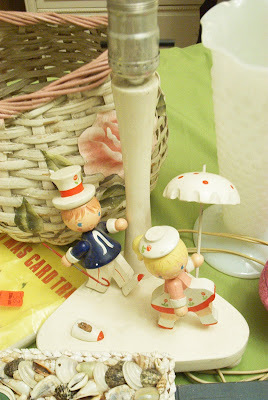 These little lasses are cheering up my dining room table...which I do desperately want to replace. The wood color is my pet peeve...but at least it matches the floor. Ohhh I'm so excited I can hardly stand it! 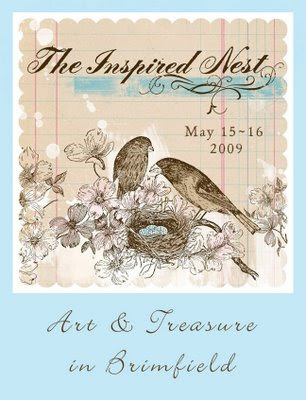 Heather from Speckled Egg and Heidi from Birds of a Feather are hosting The Inspired Nest, a Silver Bella style creative retreat and gathering that coincides with the famous Brimfield Antique Show in May. There will be a day of sourcing the best vendors at the Brimfield Antique Show, a delicious (and well deserved) Welcome Dinner, a "charming" swap, a full day of amazing classes, luncheon, and vendor faire.... And in addition to that excitement...they've invited ME to teach a workshop for the event! I of course am honored! 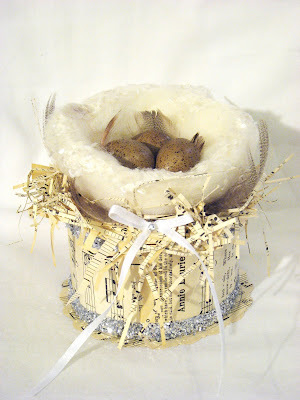 Heather and Heidi are each teaching a class too...all whimsical nest themed.